Stephen King has written over fifty novels, nearly two hundred short stories and five nonfiction books. His books have sold more than 350 million copies, been adapted into Hollywood blockbuster movies and he has won many awards for his work. So why exactly did Stephen King choose to write books under the pseudonym of Richard Bachman? Following the success of his first few novels, Stephen King was restricted, by his publisher, to publish just one book a year; for fear that the market would otherwise become flooded by Stephen King books. King, however, was keen to publish more, so he convinced his publishers to allow him to publish books under a pseudonym. The first name that Stephen King came up with for his alter ego was in tribute to his maternal grandfather, Gus Pillsbury, but, King finally settled on the name of Richard Bachman. Stephen King took his inspiration for the name of Richard Bachman from two sources. He took Richard from the pen name of the writer Donald E. Westlake, who wrote under the name of Richard Stark and, for the surname, King took Bachman from the name of the band Bachman Turner Overdrive. It wasn’t only Stephen Kings desire to publish more than one book a year that drove him to write as Richard Bachman, it was Kings’ own insecurities about his success. He wanted to know whether people were buying books because they were good, or just because he was Stephen King. The Bachman books were, therefore, released with only minimum of publicity, to find whether it was the brand that was selling or the creative writing. Stephen King went to great lengths to avoid the true identity of Richard Bachman becoming public knowledge and often denied that he had anything to do with Bachmann. He even published a fictitious biography and he used an author photograph that turned out to be a picture of Kings’ literary agents’ insurance advisor. The true identity of Richard Bachman was revealed when a curious book store clerk from Washington, Steve Brown, delved deeper into Bachman’s’ identity after he had noticed similarities between the writing of Stephen King and that of Richard Bachman. After a bit of digging, Brown found documents at the Library of Congress, one of which identified Stephen King as the author of a Richard Bachman novel. The truth was out and in an article published in the Washington Post, it was announced that Richard Bachman had died from ‘cancer of the pseudonym’. 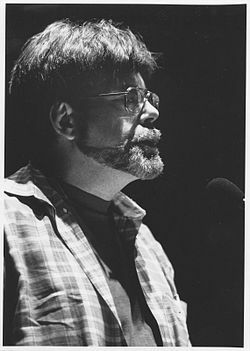 The books of Richard Bachman were written by Stephen King in a slightly more serious mind than his regular work, as he was trying to impress the critics rather than sell to his fan base. King wrote seven novels in all under the name of Richard Bachman; Rage (1977), The Long Walk (1979), Roadwork (1981), The Running Man (1982), Thinner (1984), The Regulators (1996) and Blaze (2007). 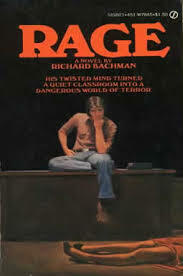 The first novel that Stephen King published under the name Richard Bachman Rage , a physiological thriller. The book tells the story of a high school senior Charlie Decker, who, having been expelled from school following a violent attack on his chemistry teacher, returns to the school with a pistol, kills a teacher and takes his classmates hostage. There then follows a narrative of the negotiations for the release of the students, combined with flashbacks to Charlie Dexter’s’ childhood. The book bore an uncomfortable resemblance to subsequent high school shootings in the US and was eventually withdrawn from print at Stephen King’s request. 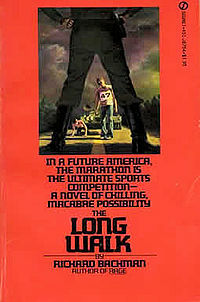 The Long Walk was actually the first novel that Stephen King wrote, despite the fact that it wasn’t published until 1979, five years after the novel Carrie was published under Stephen Kings’ own name. In The Long Walk, 100 teenage boys take part in a walking contest where each walker must keep up a pace of at least four miles per hour. If they fall below that speed for more than 30 seconds, they will receive a warning. If they slow down below that speed more than three times, they will be ticketed, which is later in the book revealed to mean that they will be shot. The winner of the marathon race will. Allegedly, win anything that they want, for the rest of their lives. The story of Roadwork takes place in an unnamed US city in the 1970’s and begins with a man giving an angry interview to a news team about a propose road extension that will mean that his home and his workplace will be demolished. Like most of the Bachman books and unlike most Stephen King books, Roadwork deals with down to earth horror with no sign of the supernatural. The interviewee, at the start of the book, turns out to be Barton George Dawes, a man who is still grieving at the loss of his son and the breakdown of his marriage. 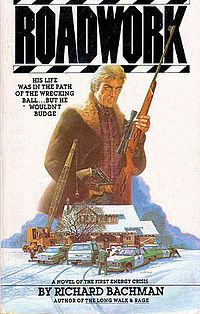 Dawes, tipped over the edge by the proposed road extension works, buys a rifle, a pistol and makes himself up a collection of Molotov cocktails before embarking on an effort to stop the building of the new road and save the house that his son grew up in. 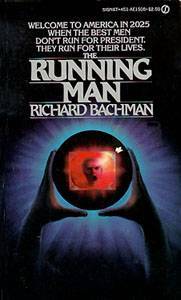 The Running Man is a Richard Bachman science fiction novel, but the name The Running Man , is probably more often associated with the Arnold Schwarzenegger film of the same name. The film, in which Arnie takes a violent route through what appears to be a film set populated by murderous ‘stalkers’ to win the prize of a pardon for crimes that he was falsely accused of, is only very loosely based upon the Stephen King novel. In the book, the main character of Ben Richards, takes part in the violent TV game show, not to clear his name, but to make money and the contestants on the game show, in the book, can run anywhere in the world to evade capture. Indeed, where the film was a pantomime science fiction vehicle for Schwarzenegger’s’ early ‘acting’ career, the book is a deeper psychological thriller which explores the growing desperation of the protagonist’s struggle to stay alive. 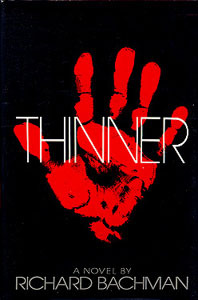 Stephen King published Thinner in 1984 and it was the last Richard Bachman book to be published under his pen name, before the true identity of the author was made public. A little more in the normal Stephen King style, Thinner tells the story of a less than pleasant, an overweight lawyer who is let off a manslaughter charge for running down and killing an old gypsy woman. The case of the lawyer, Billy Halleck, is dismissed, thanks to his friends in the right places, but on leaving the courtroom, the old woman’s father places a gypsy curse on Halleck by saying the word ‘Thinner’ to him. From this point on, Billy Halleck, starts losing weight, drastically! Halleck also learns that the judge in the case and the police chief, both of whom conspired to get Halleck of the charge, have also been cursed. Although ‘The Regulators’ was published in 1996, Stephen King still kept up the charade, albeit in a tongue in cheek fashion. 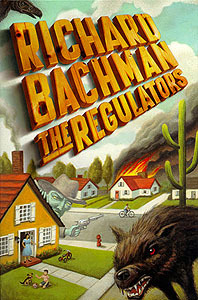 In the book's introduction, it was alleged that the manuscript for The Regulators was discovered by Richard Bachman’s Widow in a trunk and that it had been written years earlier by Bachman. By now of course, there was no real pretence that Bachman was not Stephen king and The Regulators was actually a companion book to the Stephen King novel, ‘Desperation’. In The Regulators, an autistic boy named Seth has powers to control reality and changes his home street into a dangerous Wild West caricature based upon film that the boy has seen. The final book that Stephen King published as Richard Bachman was the crime novel Blaze. The book had been written years before its publication, but Kings publisher chose to publish Salems Lot rather than Blaze. When Blaze was published it, King said that he had found it in the attic and had substantially re-written it from the first draft. 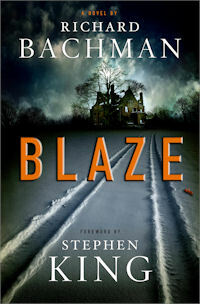 The story is about a mentally handicapped conman, Clayton Blaisdell, Jr., who kidnaps a wealthy man's son and how the protagonist came to be mentally ill. Blaze was published as a Richard Bachman book in 2007, but with an introduction by Stephen King himself and no pretence as to who the real author was.